The PhaseCam® 6100 is a highly compact, dynamic laser interferometer with a 4MP camera and fully motorized controls for measurement of optics and optical systems. With a 633 nm internal diode, the PhaseCam 6100 is ideal for long optical path-length measurement of large afocal optical systems such as concave telescope mirrors and lens systems, and for testing small aperture afocal components such as flat mirrors and collimators. The PhaseCam 6100 incorporates Dynamic Interferometry® technology, using a single camera, high-speed optical phase sensor to make wavefront measurements in less than 30 microseconds—over 5000 times faster than a temporal phase shifting interferometer. 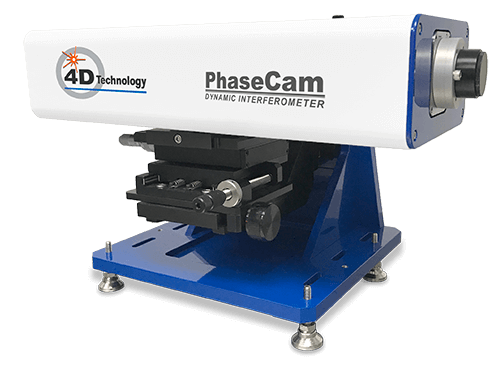 Because acquisition time is so short, the PhaseCam can be used under almost any conditions, without vibration isolation. This insensitivity to environmental factors makes the PhaseCam ideally suited for use on the production floor, in clean rooms and in environmental test chambers. Compact and lightweight, the PhaseCam 6100 was designed with performance and remote measurement in mind. Moving the system to reconfigure a test set is simple and easy, and isolation equipment is not required. The internal source and fully motorized controls ensure reliable operation in remote locations. The PhaseCam 6100 is a turnkey instrument that includes the interferometer, 4Sight™ advanced wavefront analysis software, and a complete computer system. Samples with reflectivity from 1% to 100% can be measured with a simple adjustment. The diffraction-limited, custom-designed optical system maximizes sampling of the full aperture of the test part. The easy to use, vibration insensitive PhaseCam 6100 ensures rapid and accurate data acquisition.